I was feeling a little low last week, so I did a couple of things to cheer myself up a bit. First – I went for coffee and cake – by myself! I was out and about and thought ‘why not!’ So I spilt myself with a mocha and a lovely slice of chocolate roulade. I wish I had taken a picture for you all. Then I sat back, scrolled through a bit of Facebook and enjoyed the serenity! 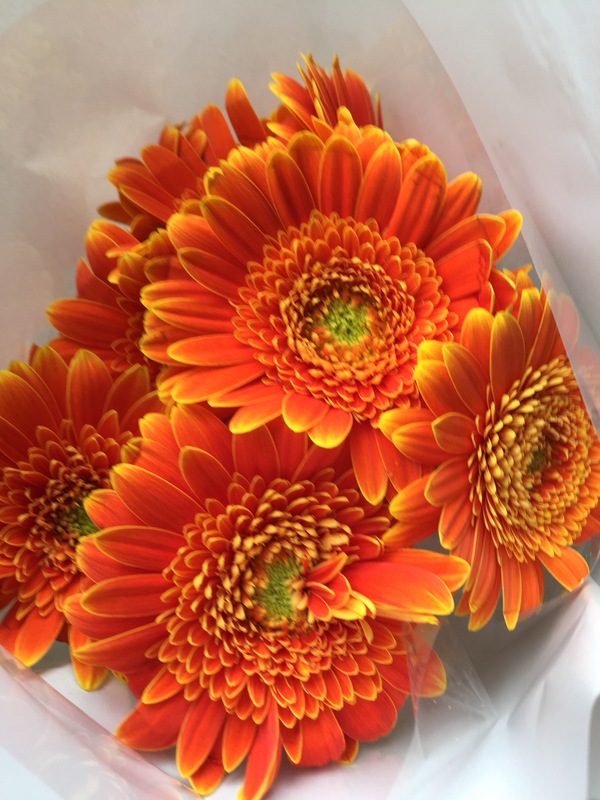 As I continued my shopping I came across a florist and found these beautiful gerbera’s. The colour was enough to really brighten my day! I actually started with daffodil delight cardstock and then used a sponge dauber with pumpkin pie ink to colour the centre of each piece. I then snipped down to the centre of each flower in each ‘scallop’ and rolled each individual petal around a tooth pick to curve them – be warned its not for the feint hearted – your fingers definitely cramp up! And there were 3 layers of this one! 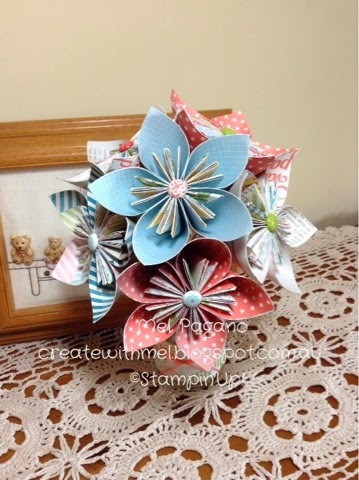 I did the same procedure with the very tiny flower from Itty Bitty Shapes Punch Pack from the 2013-2014 catalogue (a long time ago I know, but I find it hard to get rid of ANY retired items :-/) You will need two layers for this one. And then a little circle from the cupcake punch for the centre. I glue all my pieces together with tombow and then poked some holes for effect in the centre circle using what I fondly refer to as the ‘pokey tool’, but is in fact the paper piercing tool! The vase and sentiment are from the gorgeous hostess set ‘Floral Wings’ and of course the wonderful Trio Corner Punch (also retiring) for the corners! And what is a petal without a sparkle of wink of stella to make it dazzle right! This card is being gifted to a special friend ‘just because’ I can! I LOVE this job! If you have ever though about joining Stampin Up! now is a fabulous time to do it! You get the extra perks of preorder before the new catalogue is even seen by anyone else! And its definitely got some ‘to die for’ sets ! I can’t wait! I am really enjoying using our Floral Wings Hostess Set. I feel like I have two sets for the price of one. 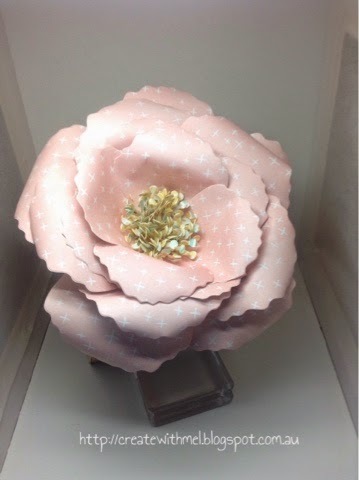 With the ability to use it for a big, beautiful butterfly or an elegant vase of flowers. Today I chose to use the vase of flowers and team it with my favourite in colour designer paper. This really is a pretty set. Versatile for birthdays, sympathy and thank you – its virtually like giving a bunch of flowers! This look is very simple to achieve. I have stamped the vase in Tip Top Taupe and fussy cut it. To get your placement of the stems just right – turn your vase over and position it on the card, then stamp your stems, making sure the bottom edge just overlaps onto the back of your vase. Once you are happy with the amount of stems, turn your vase back over and stamp the flowers. I stamped mine in Watermelon wonder, stamping off occasionally to vary the depth of the flowers. I also stamped some more on scrap whisper white card and then fussy cut them! They’re tiny – so you may need your glasses! Lol. 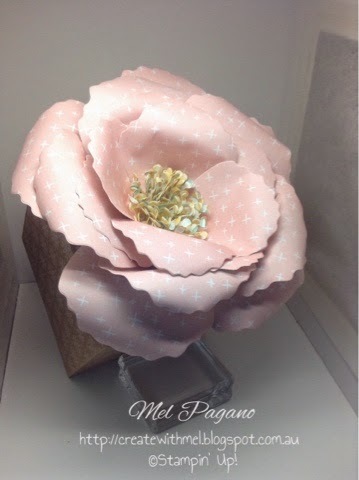 Adhere your extra flowers using dimensional. Wrap some Gold Thread around the neck of your vase, before popping it up on dimensional too. I think it’s quite effective. What do you think? You can get this stamp set yourself by hosting a workshop or spending $250 in one order to qualify for rewards to spend on hostess sets. Contact me if you would like to host a fun stamping workshop! Ok, well I know I am SUPPOSED to be finishing off everything I need to do for my market stall on Friday Night….but I came across these gorgeous paper flowers and just HAD to have a a go at creating them. I used some retired DSP for my practice set, but I am imagining them in all sorts of beautiful colours, especially in coastal cabana from the Eatern Elegance DSP, or the black and whites from Modern Medley…I think I will definitely have to put those on my next order!